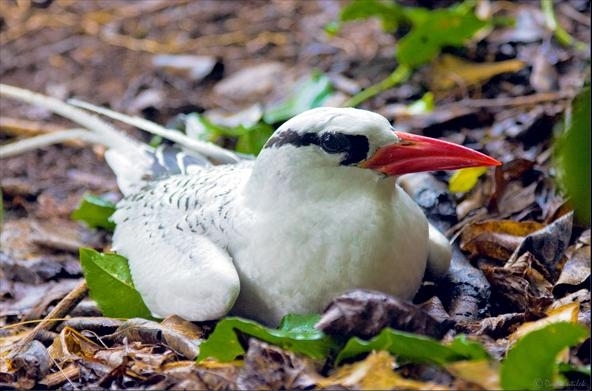 The Red-billed Tropicbird is fairly large, predominantly white, with greatly elongated central tail feathers and its bill is large and powerful, slightly curved and as long as the head. 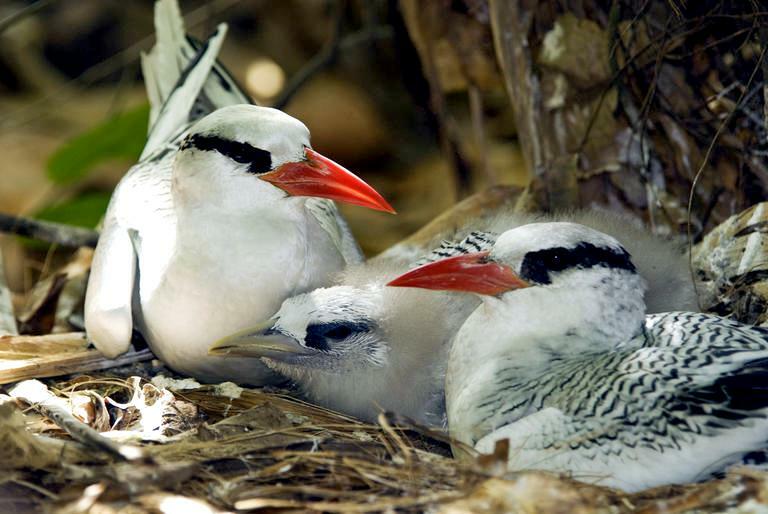 Red-billed Tropicbirds are the largest of the the 3 tropicbird species and are named after their curved, crimson bills. 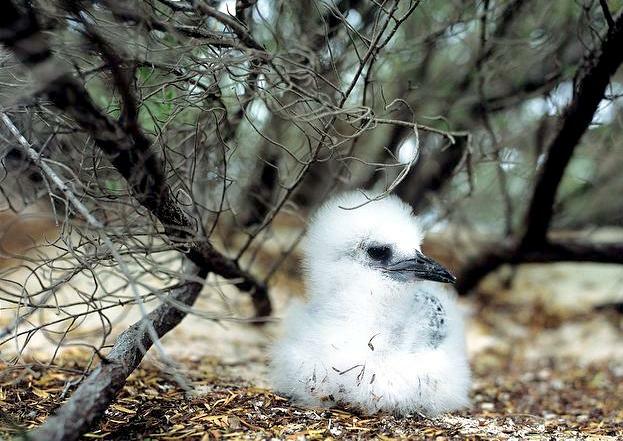 These tropical seabirds spend most of their time over the open water (pelagic), only coming on to remote oceanic islands to breed. 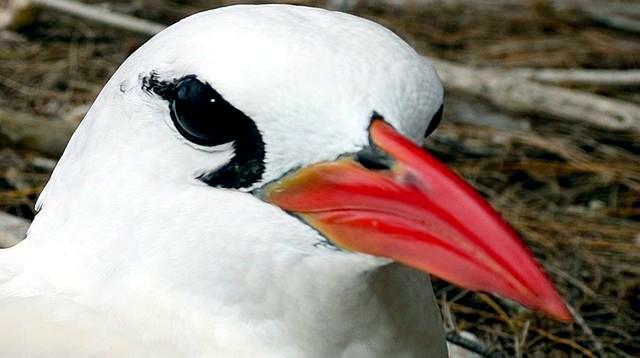 The head is rather large, neck is short & thick. 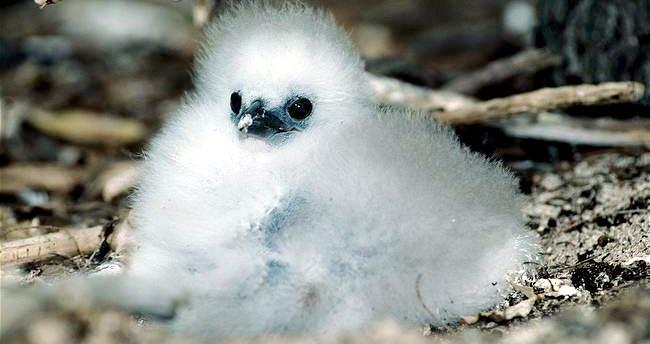 Legs are very short. 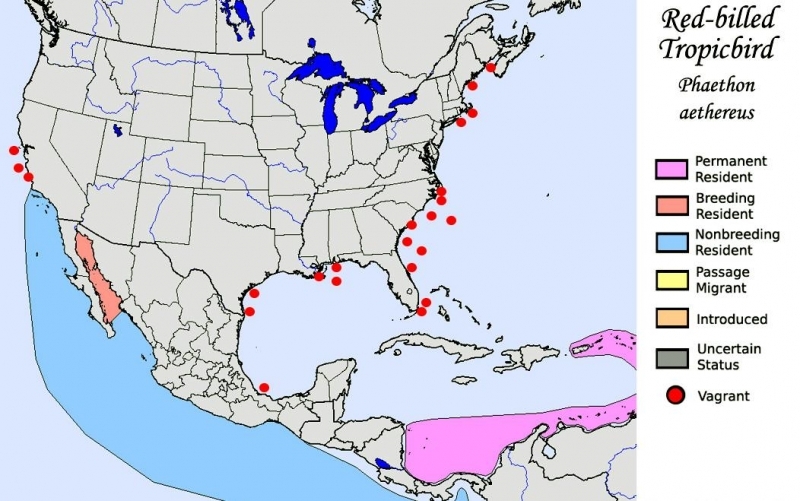 Toes are rather small and connected by webs. 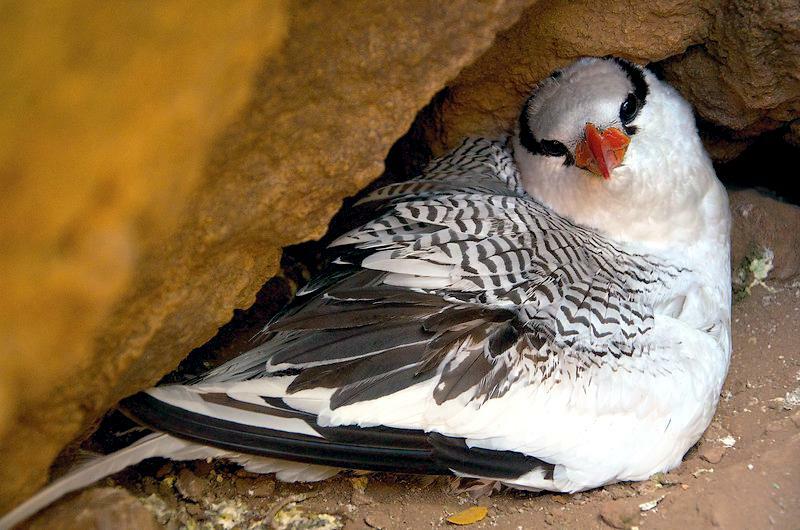 Plumage is soft, rather compact on back and wings. 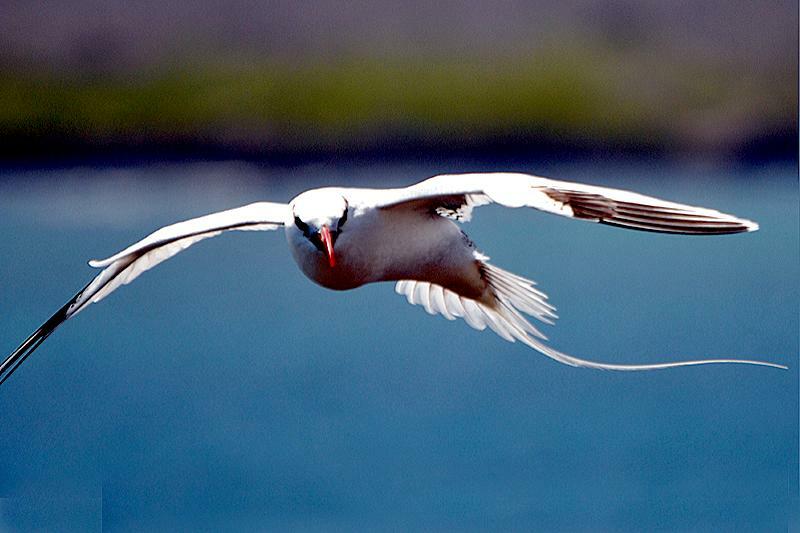 Red-billed Tropicbirds have long, acute wings. 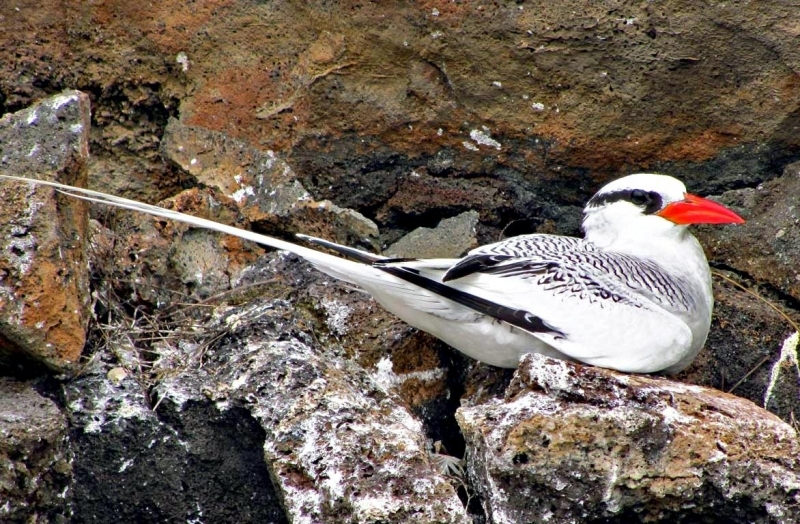 The tail has 12 feathers, wedge-shaped with the 2 middle feathers extremely elongated, narrow and tapering. 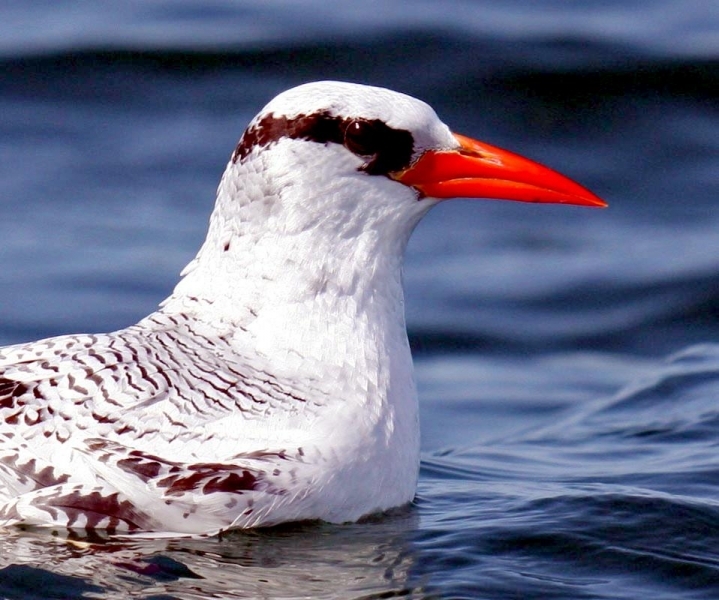 The bill is orange red, iris is brown. 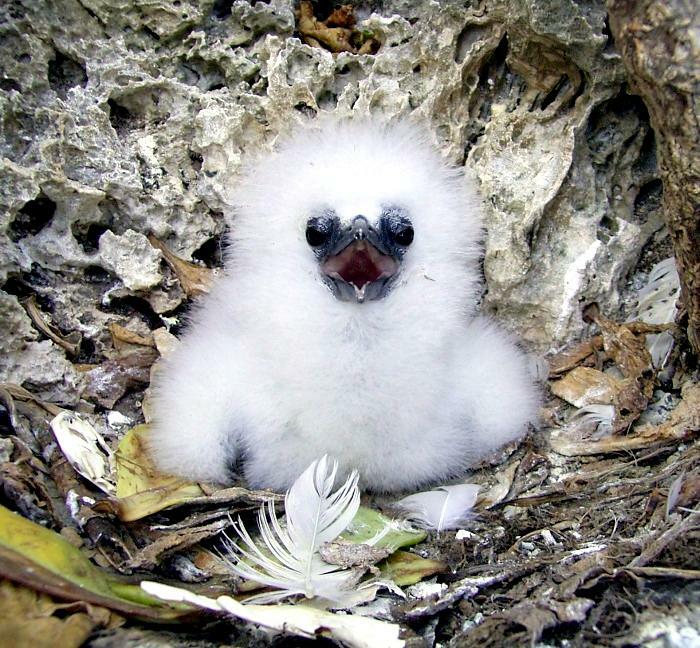 Tarsi and base of toes are yellow, webs & claws are black. 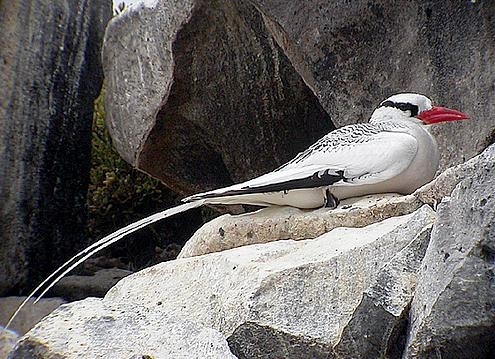 The general color of plumage is pale pink, with the 2 median tail feathers redder. 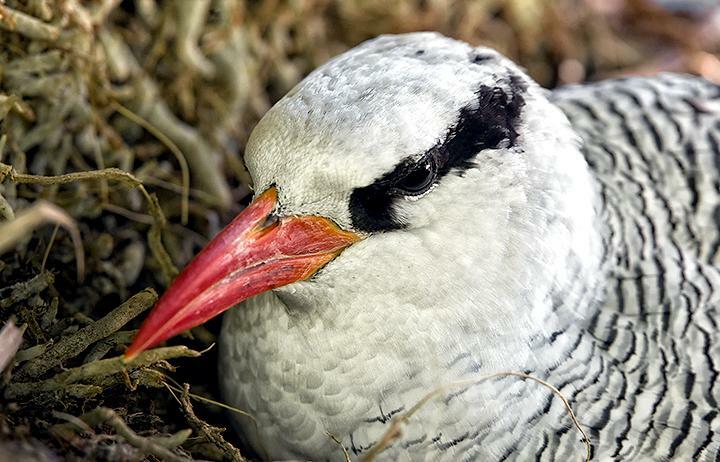 Red-billed Tropicbirds have a curved spot before the eye and a black stripe behind it. 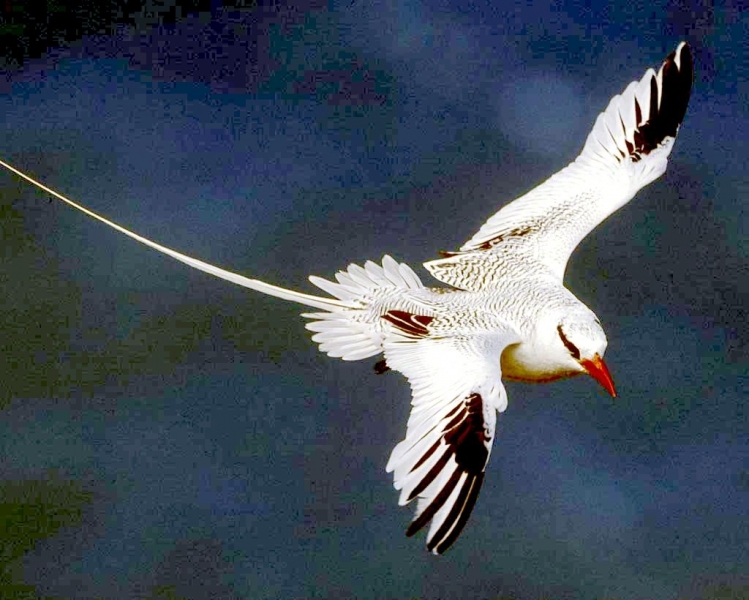 A black band extends across the wing from the flexure to the extremities of scapulars. 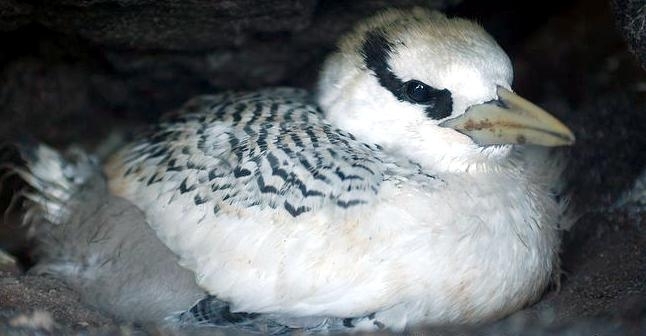 There is a black spot on some of primary coverts. 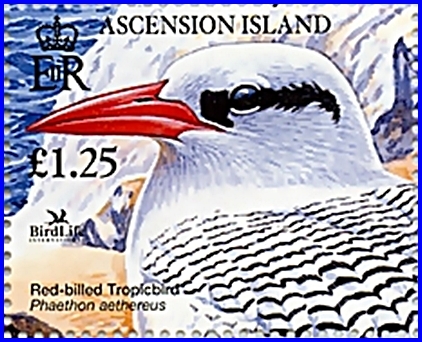 Females resemble the male, but is less tinged with red and the bill is yellow. 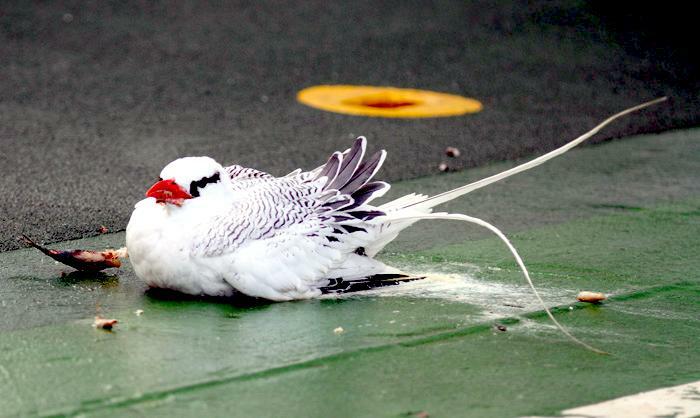 Tail feathers are also less elongated. 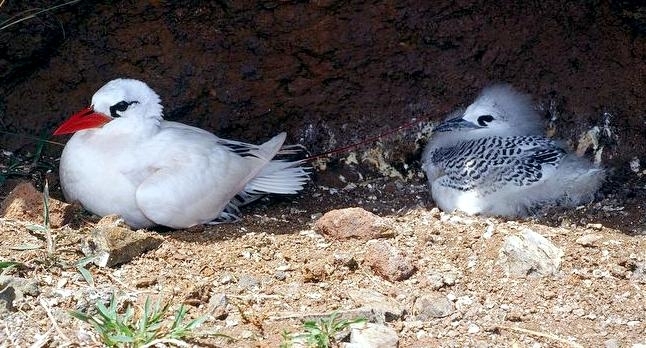 Juvenile Red-billed Tropicbirds resemble the adult, but has yellowish bill, blacker on nape, black sub-terminal spots on tail and feathers and lacks elongated central tail feathers. 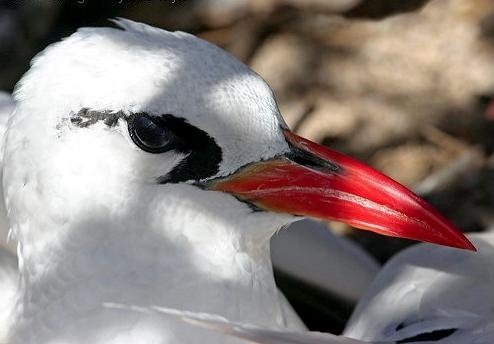 Red-billed Tropicbird’s typical calls are loud, piercing, shrill but grating whistles and crackles, often given in rapid series when in display flight at colony. 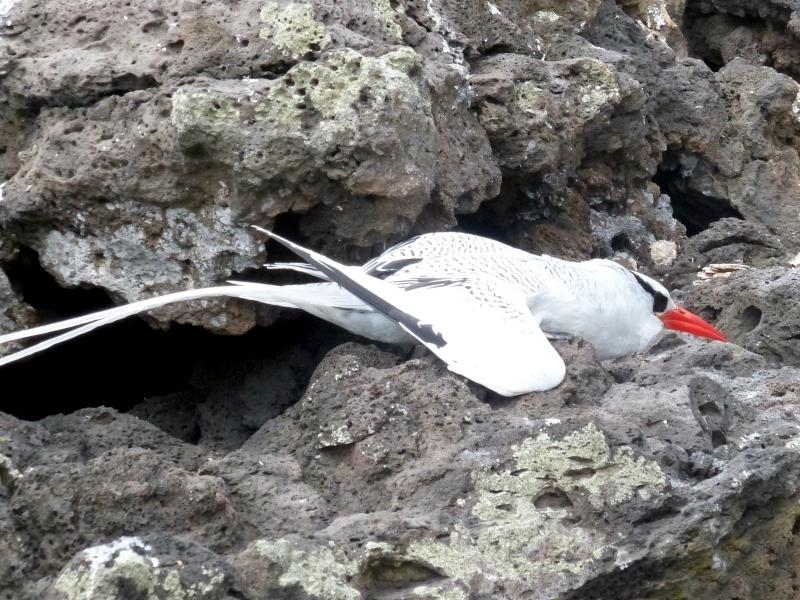 The Red-billed Tropicbird breeds in large holes and crevices or under boulders on rocky offshore islands in tropical & subtropical seas. 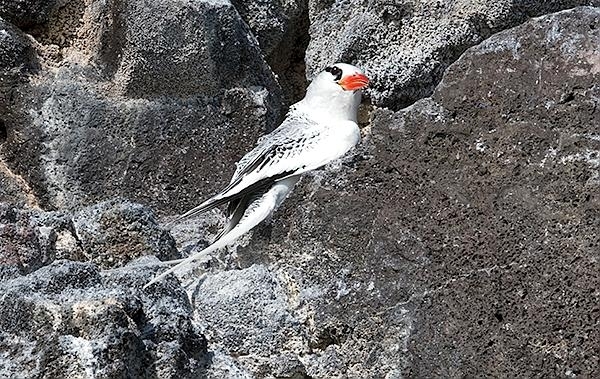 It prefers inaccessible spot on cliff, where takeoff is relatively easy. 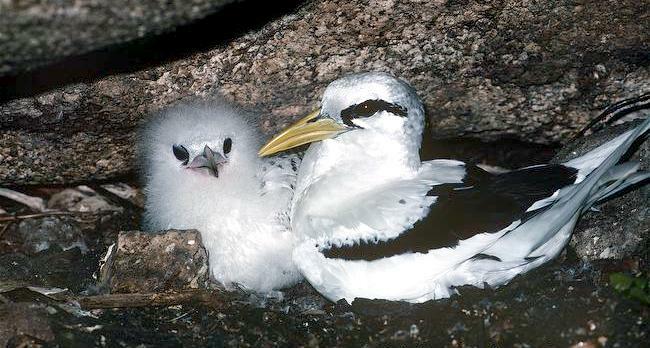 It’s pelagic away from breeding colonies. 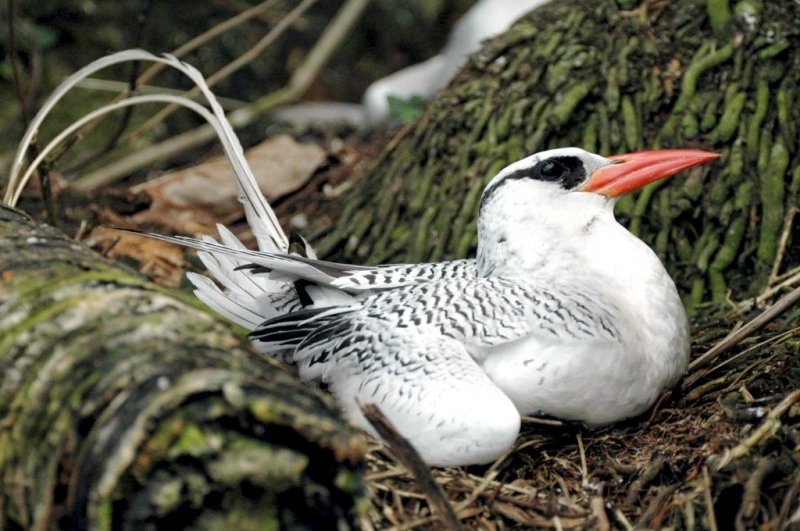 The range of the Red-billed Tropicbird includes the tropical Atlantic, eastern Pacific, Northwestern Indian Oceans. 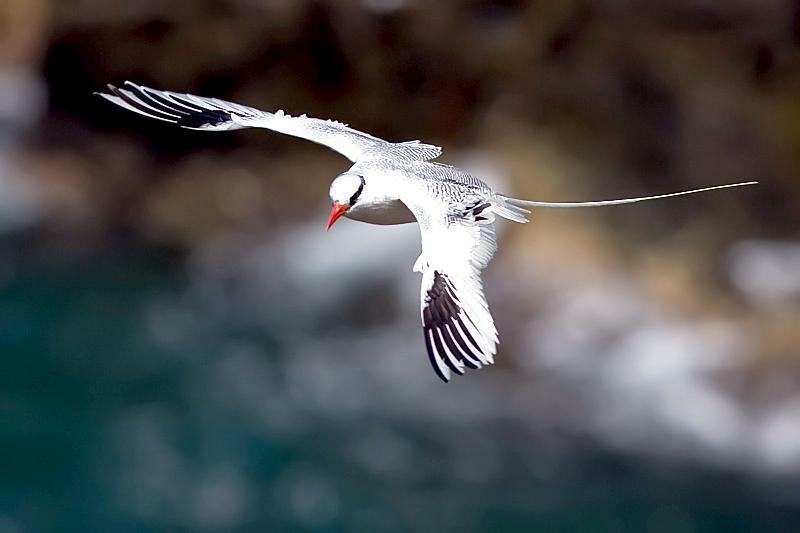 A Red-billed Tropicbird catches its preys by hovering and then plunge-diving, generally only into surface layer. 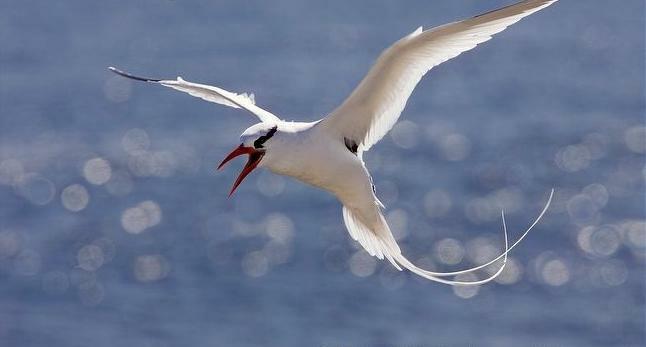 It inspects ships but does not follow them. 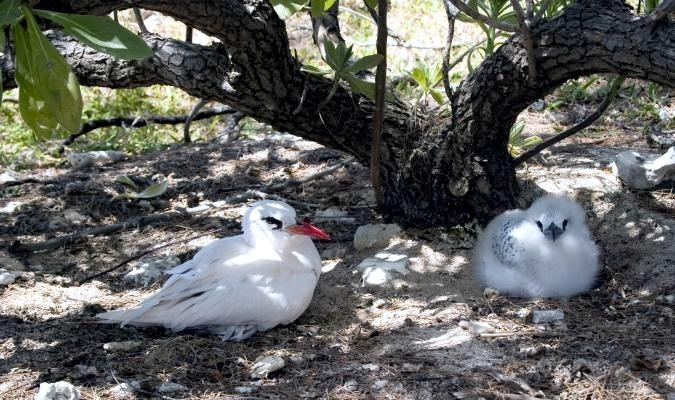 Red-billed Tropicbirds generally solitary or in pairs away from breeding colonies. 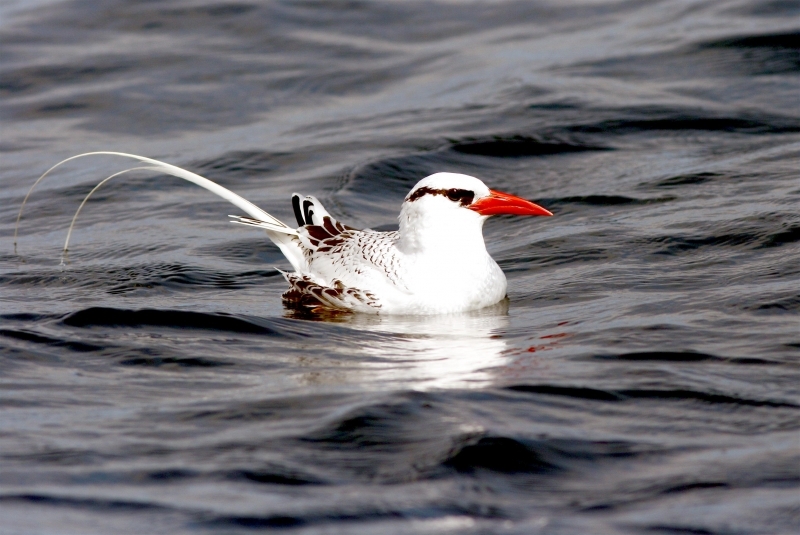 It seats buoyantly on water with tail half-cocked to keep it dry. 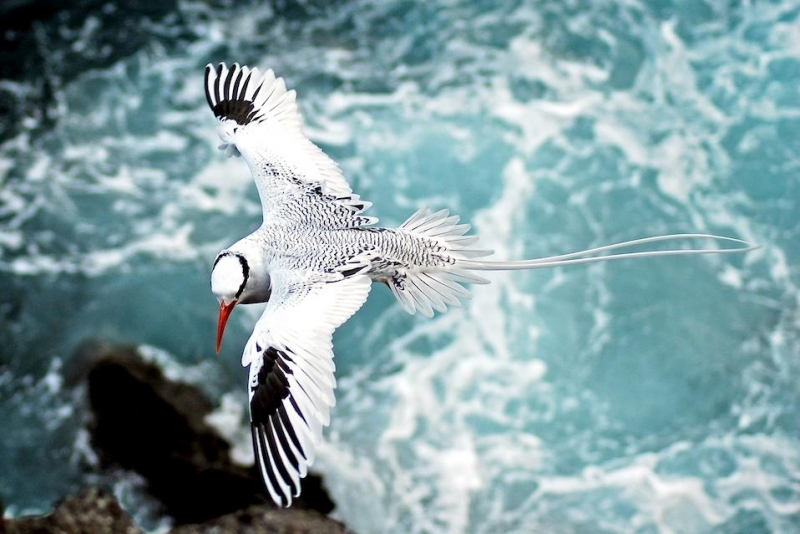 These birds stay most of time in the air. 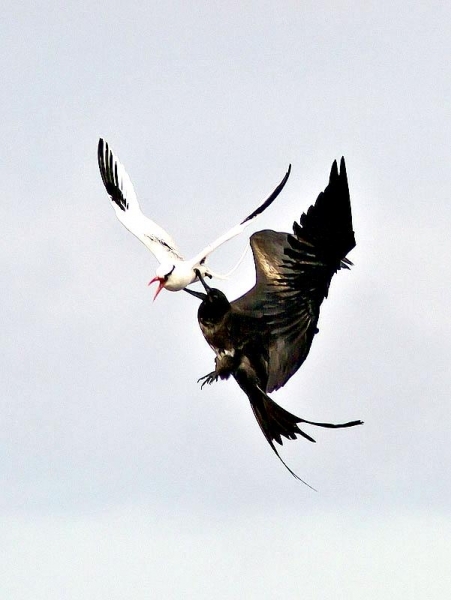 Courtship display occurs in flight. 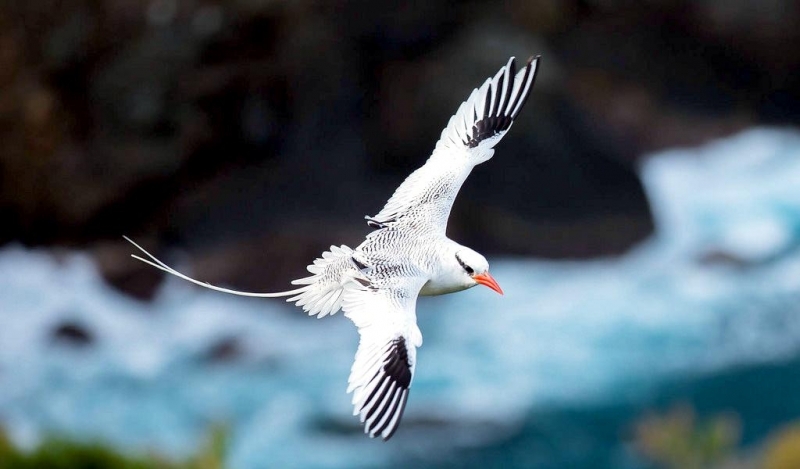 Several birds fly close each others, uttering loud calls and flying as fast wing-beats as long down glides with their long tail feathers downwards. 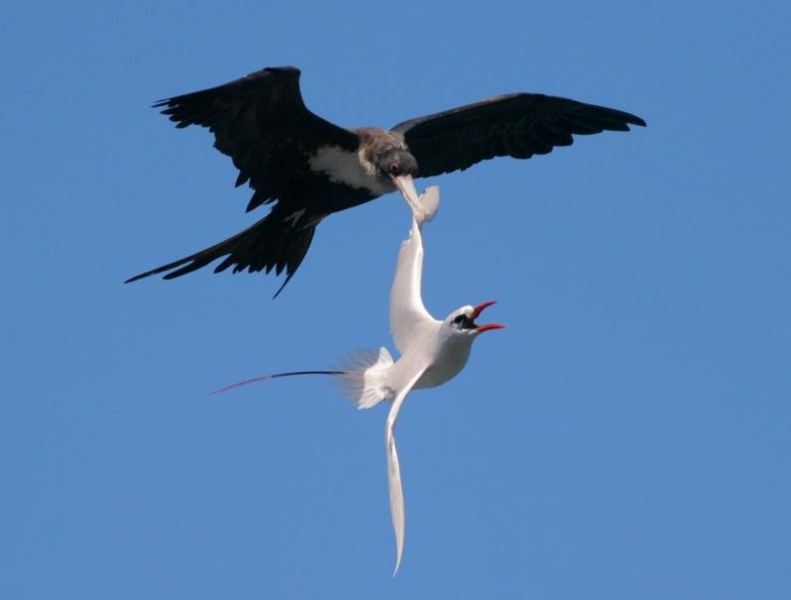 Strong disputes break out between males to protect their mates & nest areas. 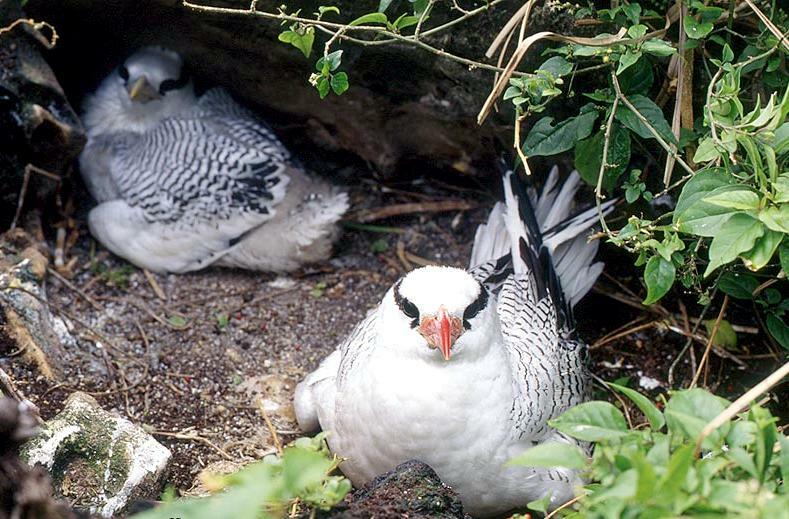 Colonies located on islands consist of several hundreds of breeding pairs. 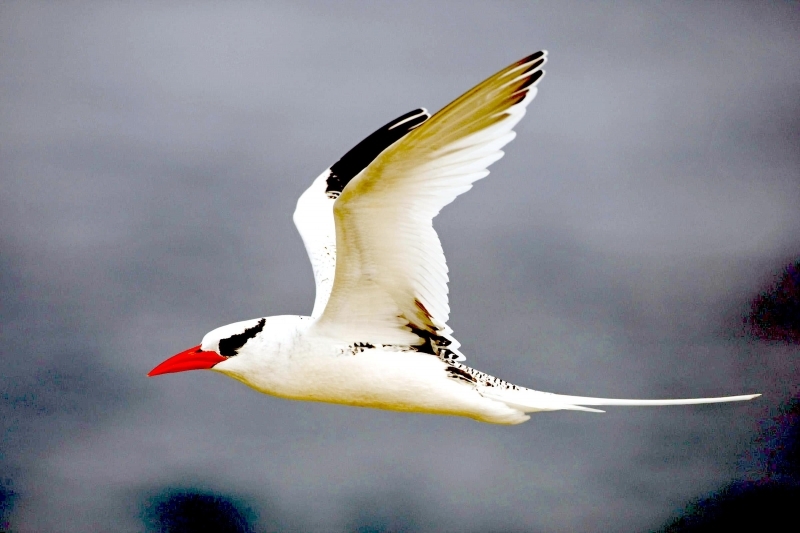 No regular migration is observed. 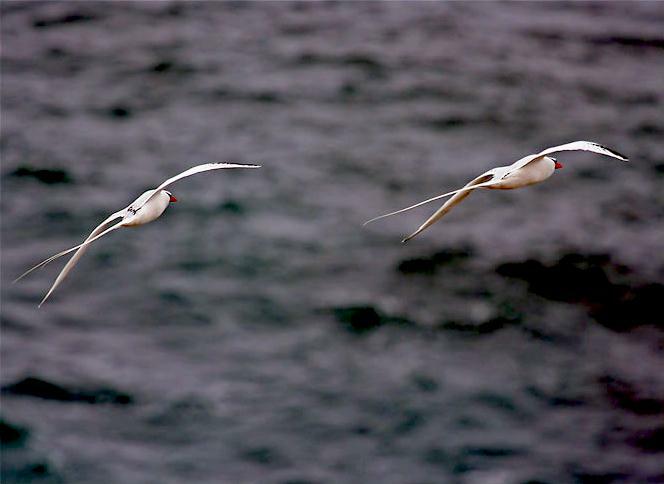 We can see an extensive dispersal especially of juveniles, often over water fairly near breeding areas. 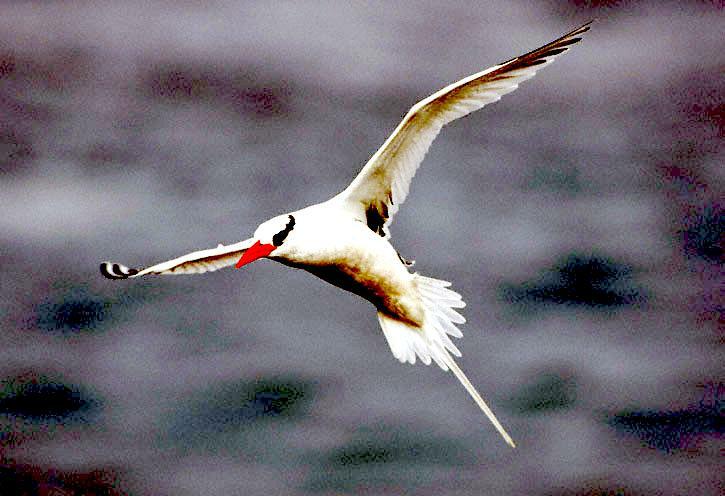 Some adults can be seen vicinity of colonies all year round. 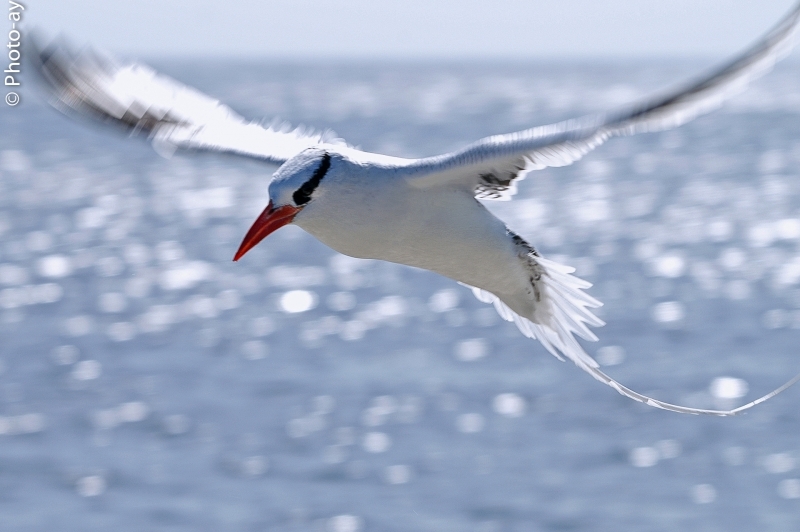 The Red-billed Tropicbird flies well above surface with direct, rather pigeon-like flight action, often interspersed with long glides. 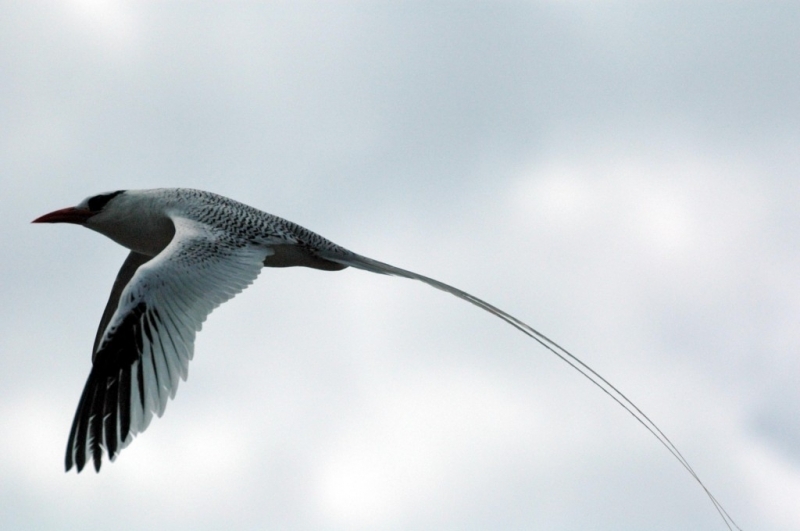 Often soar high into sky. 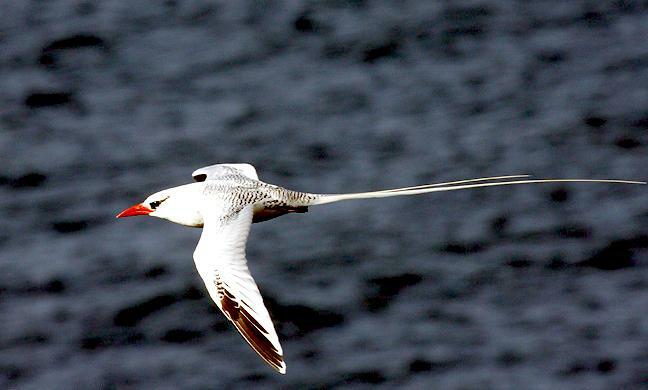 Its elongated central tail feathers curl and undulate in flight. 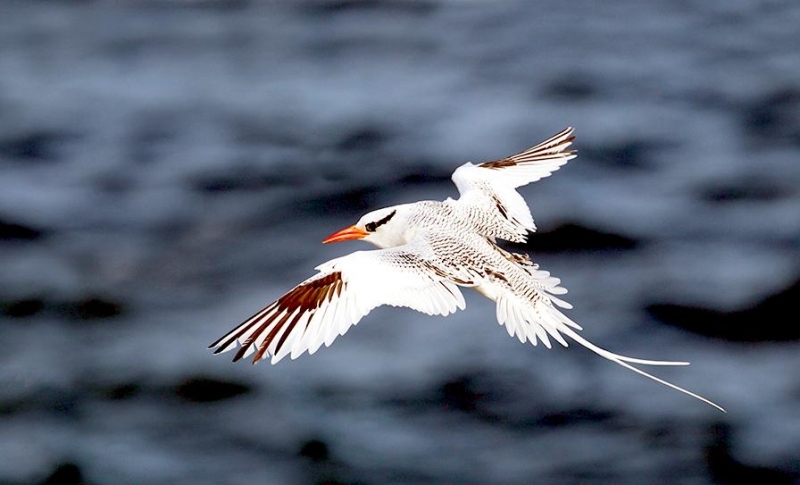 They have an acrobatic flight when pursue flying fishes. 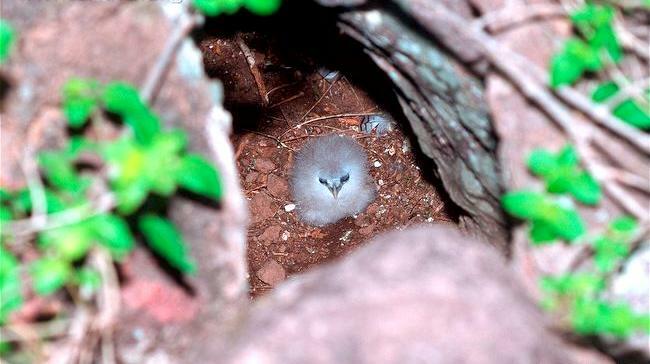 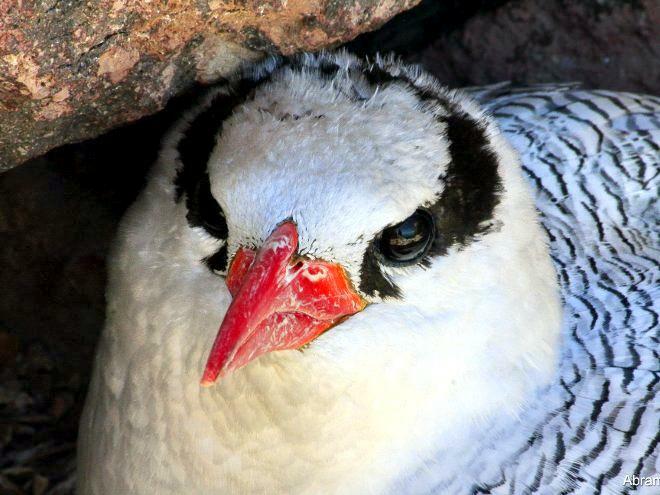 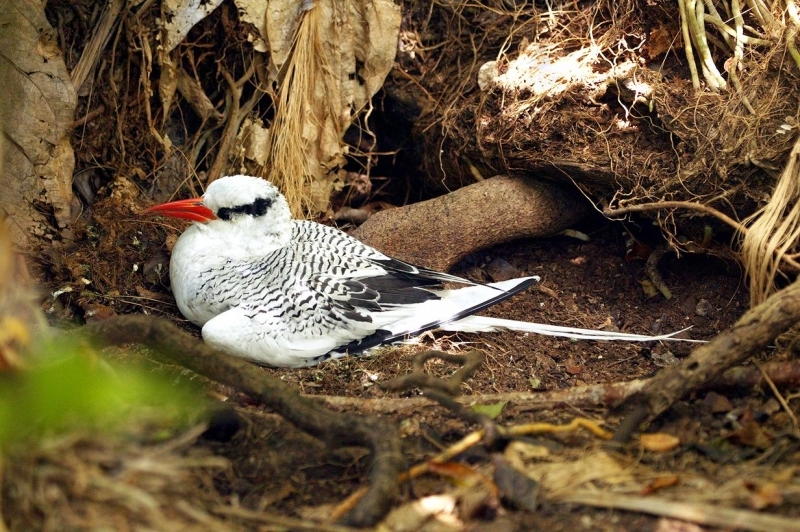 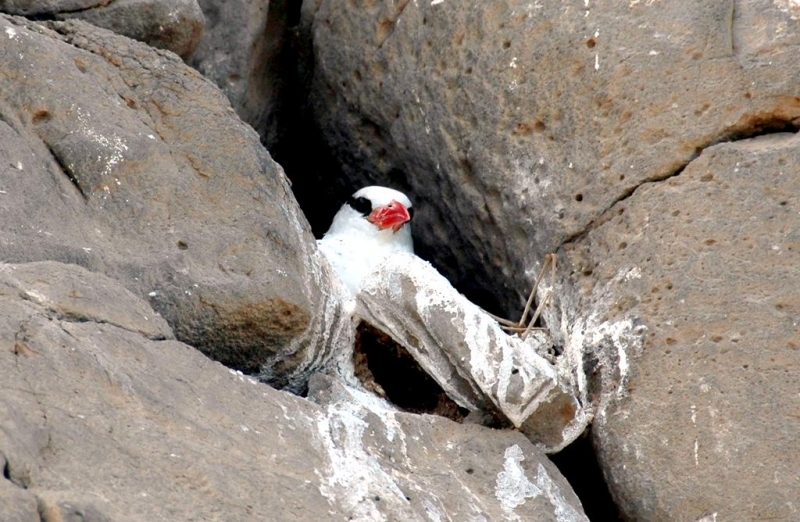 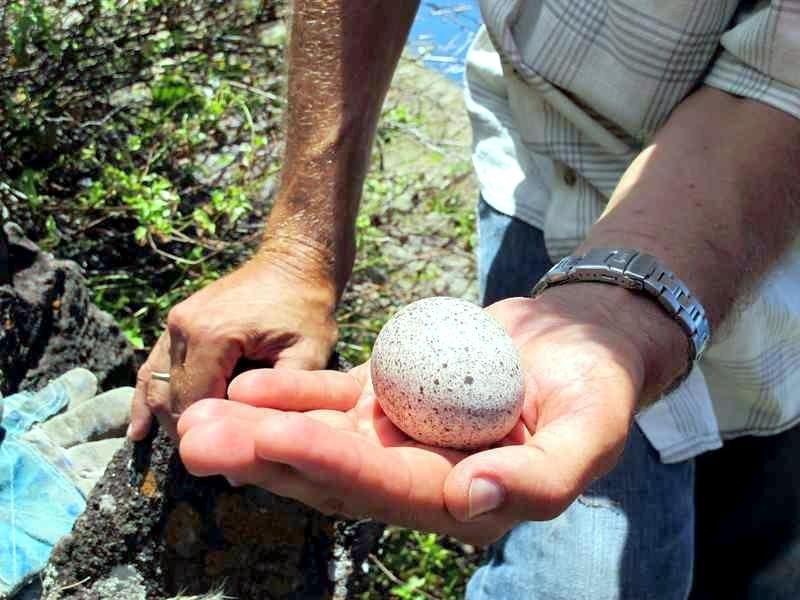 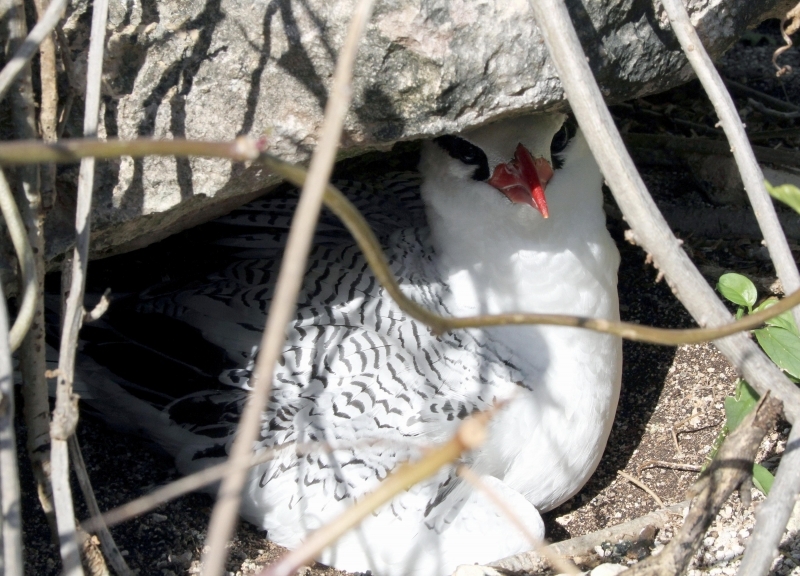 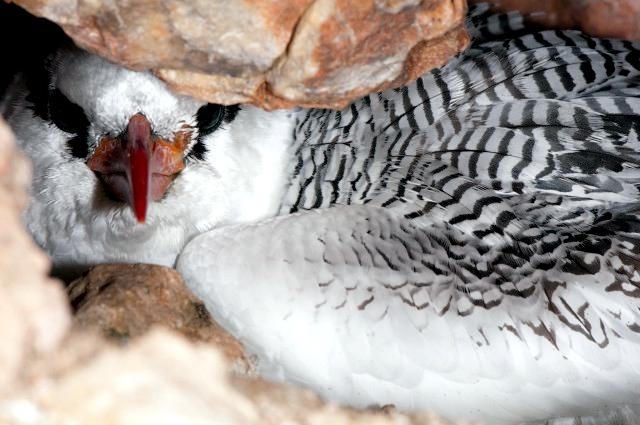 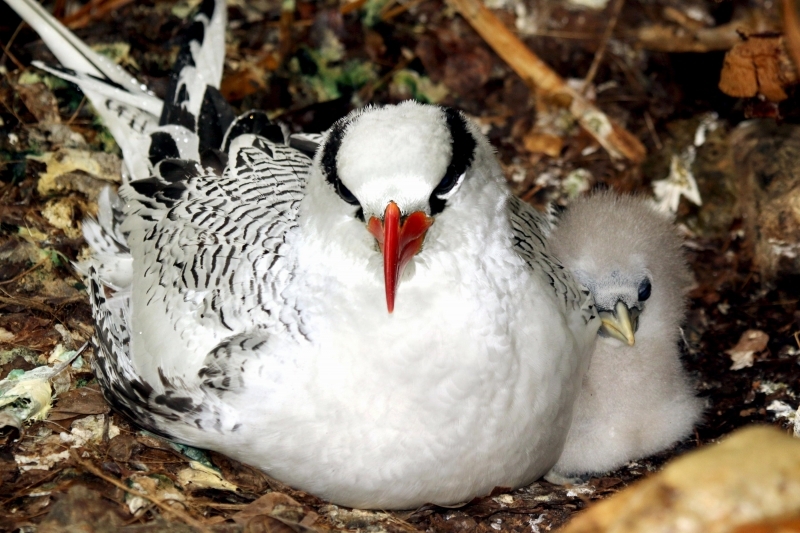 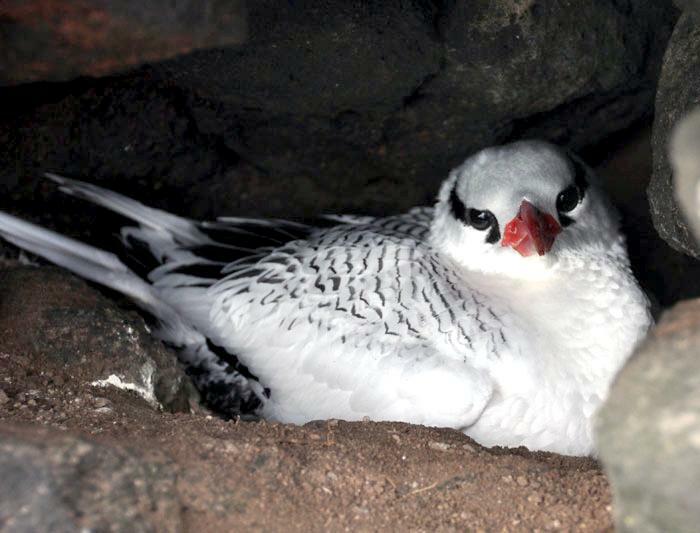 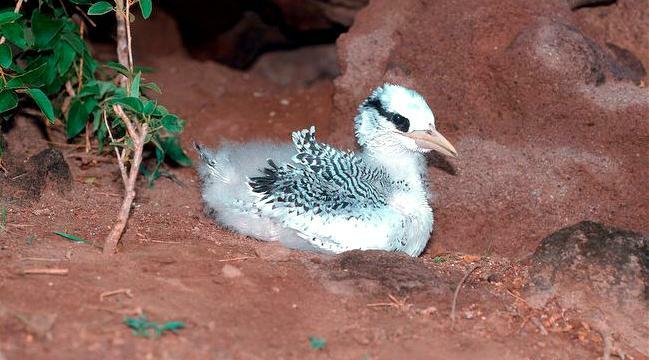 Red-billed Tropicbirds nests in a hole or in a crevice on the bare ground. 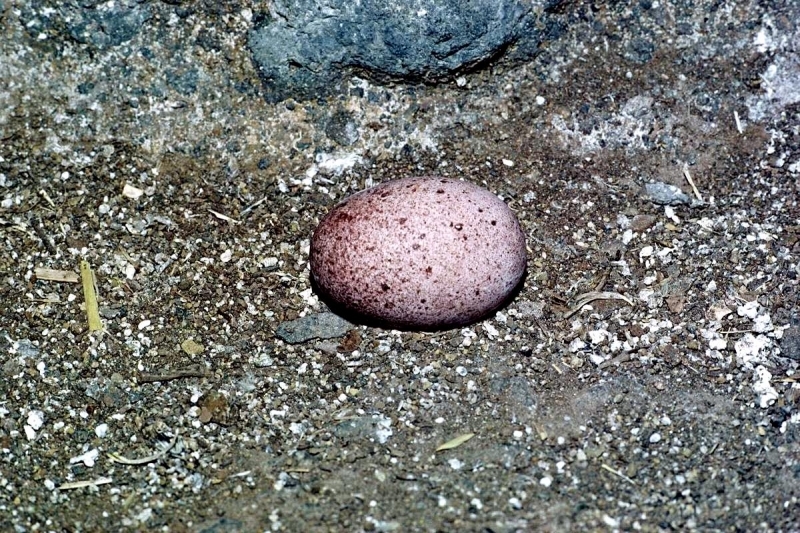 The female lays 1 white egg, spotted red-brown. 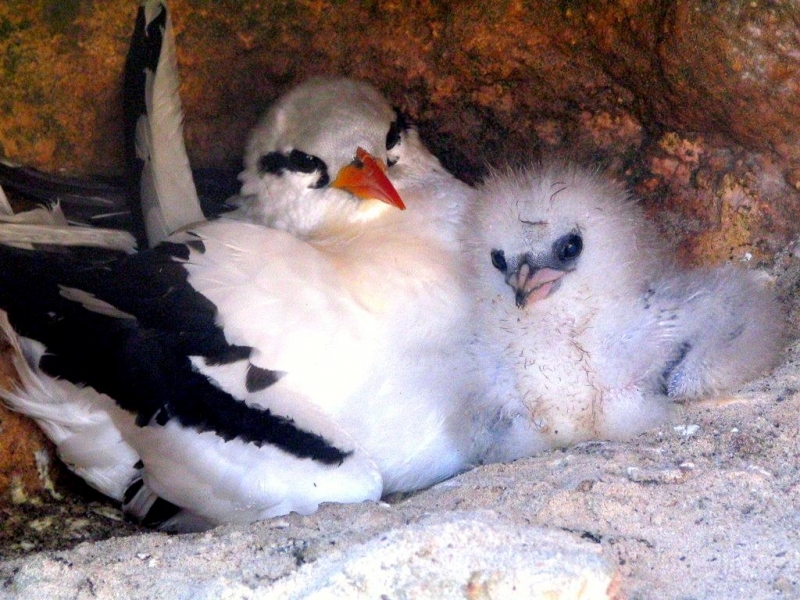 Incubation lasts about 40 to 46 days by both parents, but female most of time while the male feeds her. 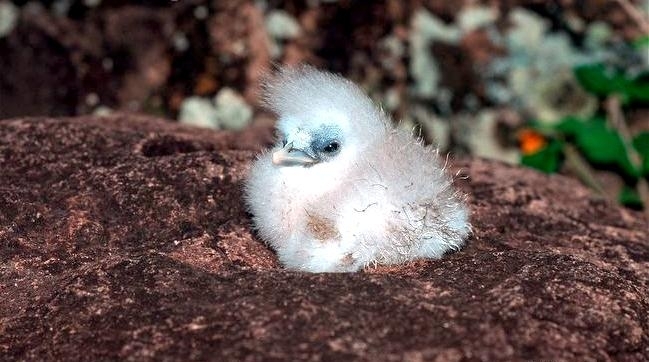 Chick hatches with gray down. 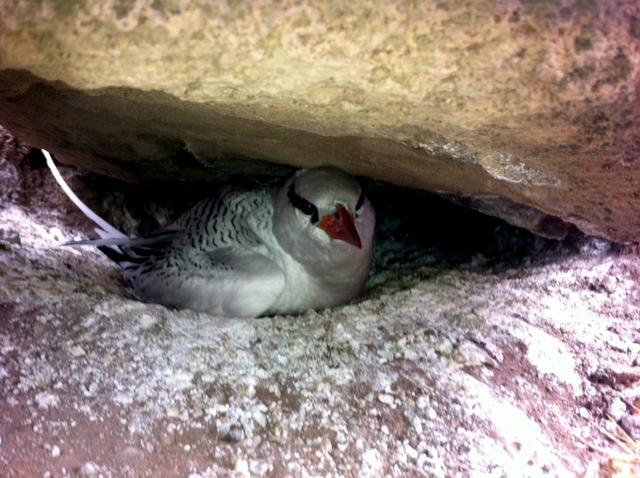 It stays alone at nest while parents search for food. 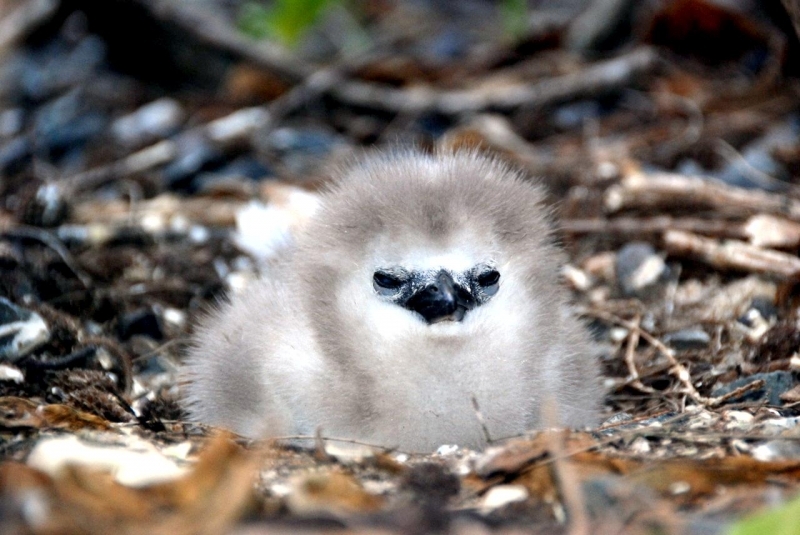 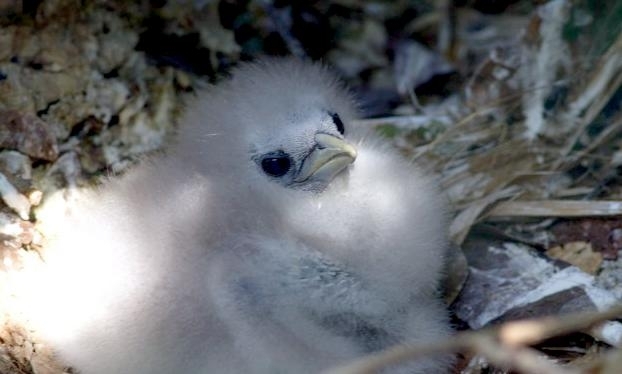 Parents feed the chick twice every 3 days, until fledging around 12 or 13 weeks after hatching. 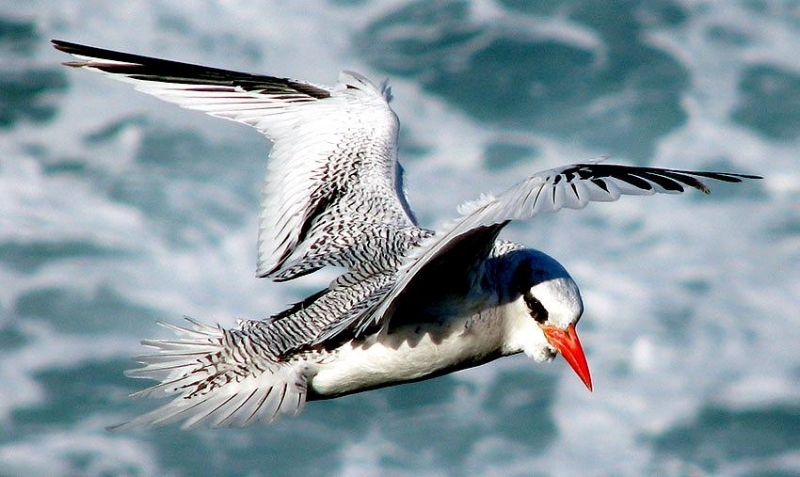 The young are not able to fly and stay on the water several days, loosing weight until they can soar in the air. 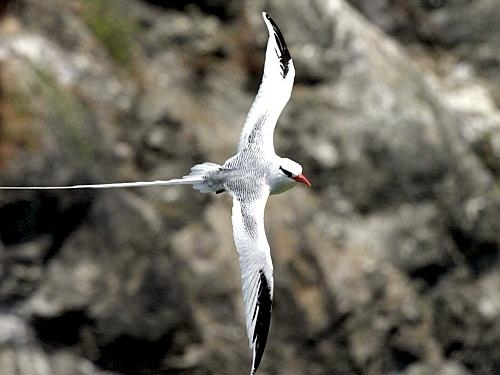 The Red-billed Tropicbird feeds on fish, especially Flying Fish and small squid. 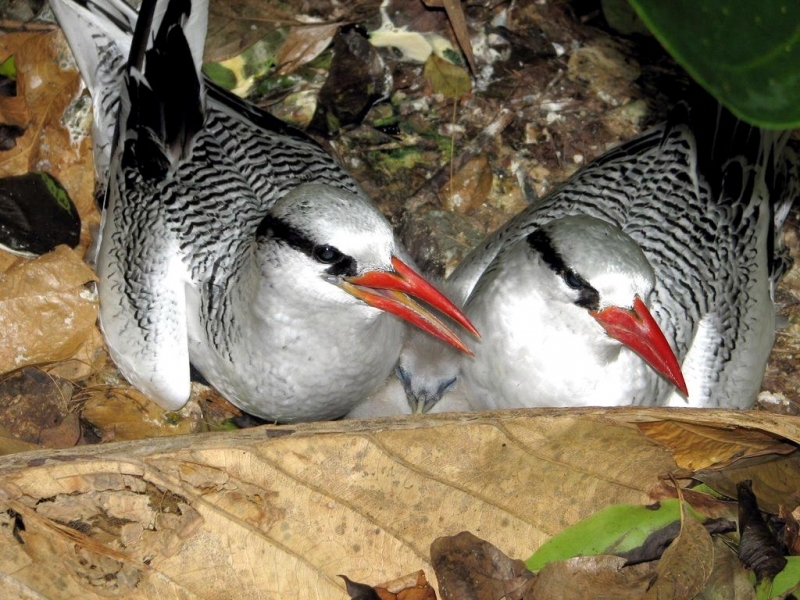 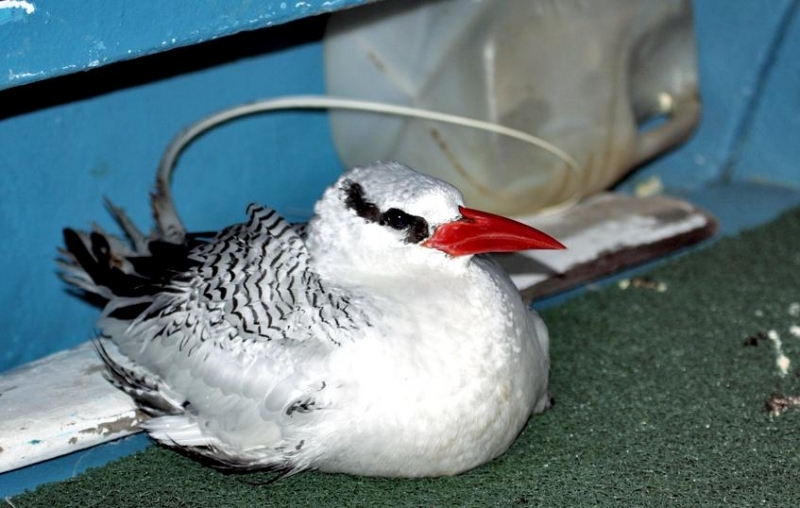 Red-billed Tropicbirds are probably the less numerous of tropicbirds, but population is not globally threatened.